The standard workflow with web development is run the web application, make some changes to your CSS in Visual Studio, flip back to the browser and reload the page to see the effect. While this works relatively well it can be somewhat slow at times. Sometimes a utility comes along that is so incredibly useful that you wonder how you managed to live without is. 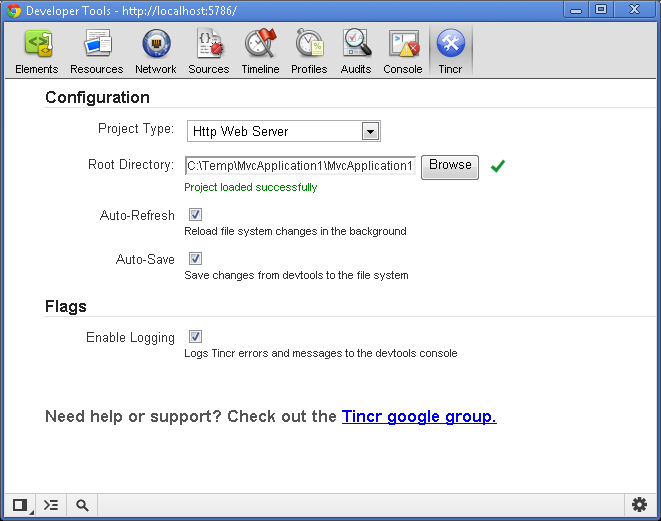 Tincr is one of those plugins for Chrome that makes you wonder how you could do web development without it. Here is a short demo from the maker showing Tincr in action. 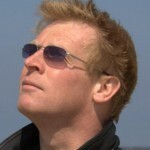 Using Tincr with an ASP.NET MVC application is easy. 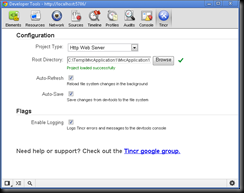 After installing Tincr you will see an additional tab in the Chrome developer tools. Select this and set the project type to HTTP Web Server and select the root directory for the project. By default auto refresh and auto save are enabled allowing for 2 way syncing. Make sure to keep the Chrome Developer Tools open and switch back to Visual Studio and make some changes to your CSS. As soon as you save the file you will see the browser window update. Unfortunately this plugin won’t install on Google Chrome running on Windows 8 even though other plugins work just fine. I am not 100% sure why but believe this is because it uses the NPAPI Chrome File API to get access to the file system. Update: Lauricio Su came up with a good workaround. See here for more details. Posted: November 17, 2012 . Posted in: AngularJS, ASP.NET, ASP.NET MVC, Chrome. Bookmark the permalink.